This tiger ebony wood mala ranges from light to dark, often in the same bead. This mala is a meditation on varied tones, strung with ultramarine blue Czech glass marker beads. It is light weight and hand-friendly, a perfect companion for meditation. I strung it with love and prayer on nylon-coated beading wire that coils softly. A blue cotton tassel with gold thread wound around it finishes it. This mala measures about 20 inches long, and has three blue glass markers. Two at the 21st spot on each side and one at the top, or 56th spot. It is a 108-bead mala with three markers added. Happy to customize number of marker beads or placement, just leave a note during purchase. No extra charge. Tax will automatically be added to California sales at Paypal checkout. 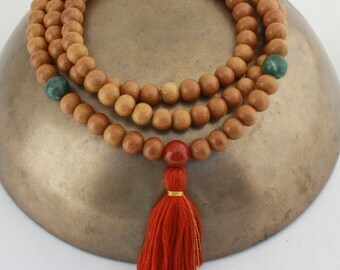 What a beautiful mala set!! Exactly what I was hoping for! Laura has such a great eye for color, and she really took the time to talk with me and understand what I was picturing. Thank you, Laura!! Enjoying it so much already! Simply fantastic! The beads are even more beautiful in person. This was a custom piece for a dear friend. I've worked with Laura several times and each time she has made really wonderful pieces that my friends have been truly grateful for. She's an absolute delight to work with and went above and beyond to deal with some weird post office issue that occurred. Beautiful Mala, lovingly wrapped and consisting of high quality gems. Currently accepting Paypal as well as Etsy's direct checkout system. If you're unhappy with your purchase, contact me within 7 days of delivery. After communicating with me please mail it back securely packed with a return address, insurance, and delivery confirmation. It should be smoke-free and in original condition. Refund or exchange will be given as soon as your mala is received, minus shipping charges. Please note that semi-precious stones and natural woods and seeds are used. Variations in the markings on the beads are natural and part of their beauty. 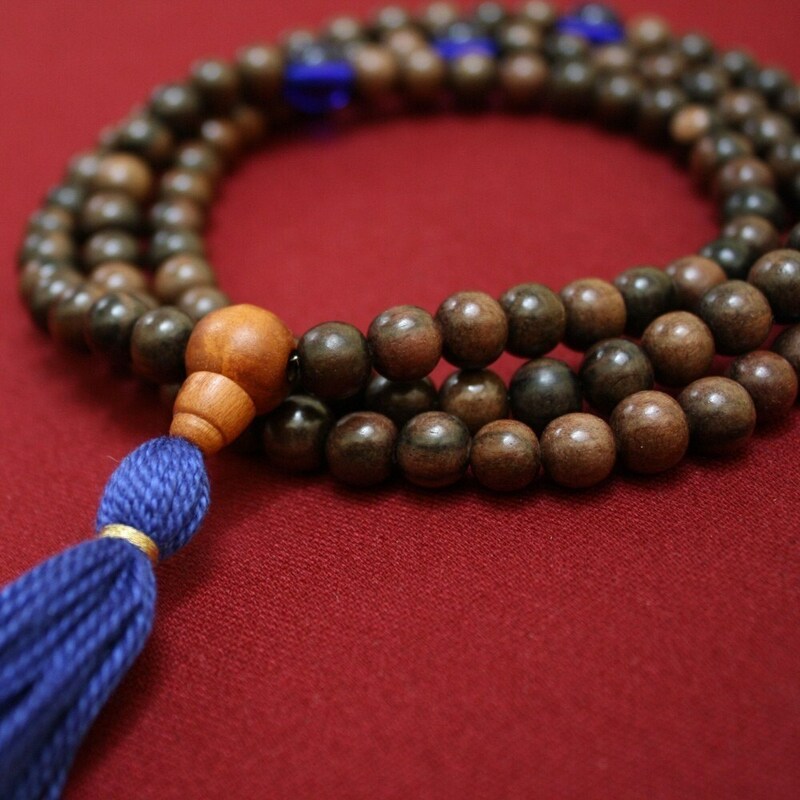 Guarantee - If there is a breakage of a mala within the first two months it will be restrung and shipped back at no charge! Shipping costs are easily visible in a tab above listing description and shown in the shopping cart. Costs are reduced for combined shipping - the second item and more have a reduced shipping price. Shipping is through the USPS, securely packed and clearly labeled. The customer is responsible for any customs fees. Please watch for notices from customs that your item has arrived. Packages can't be marked as gifts. Shipping is within 7-10 days unless you've ordered a special mala or restringing. 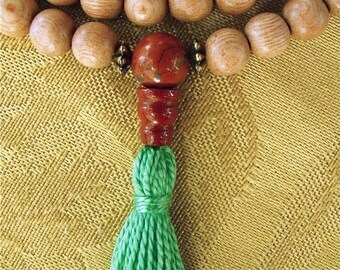 Sizes are given in the mala listings - the measurement is in length, from top bead to the bottom of the tassel, not total circumference. If your wrist mala doesn't fit well, simply return it for free resizing. All you'll pay is the postage each way. These malas are made to last. Try not to wrap your mala tightly. Avoid putting stress on the cord, especially around the guru bead. Keep malas in a soft bag when they're in a purse or backpack to avoid scratching or breaking soft stones. Wrist mala care: Avoid overstretching them. Lotions, sprays, or perfumes can weaken stretch cord over time.